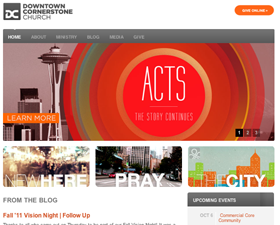 The New Here page is a great landing page to direct friends and visitors to learn about Downtown Cornerstone. Plus, you can now log on to The City directly from our website by clicking The City banner or selecting “The City” in the Ministry drop-down menu. We hope these updates provide you with a more well-rounded view of what Jesus is doing in and through our church and how you can get involved. Please email us if you find any broken links or grammatical/spelling errors.